There are only two more rounds left in the Regular Season in NEBL. Here is the last round review presented by ESL. The most exciting game of round 10 in the NEBL took place in Belize City. This derby game ended with only two-point home defeat of 5th ranked Defenders (4-6) to second ranked Dream Ballers (8-3) 83-81 on Friday evening. Great defensive blocking was one of the keys in this match when Dream Ballers made 9 blocks. Guard Jamal Kelly (-90) scored 27 points to lead the charge for the winners and Delvon Henderson chipped in 13 points, 12 rebounds, 4 assists and 6 blocks during the contest. At the losing side American center Nigel Jones (201-90, college: Talladega) responded with 21 points. Defenders' coach tried various players' combinations and tested in total fourteen players in this game, but that didn't help. Dream Ballers maintains second position with 8-3 record behind leader Verdes. Defenders at the other side keep the fifth place with six games lost. Dream Ballers will have a break next round, and it should allow them to practice more before next game. Defenders will play on the road against Tigersharks (#3) in San Pedro and it may be a tough game between close rivals. Very significant was Dream Ballers' (#2, 8-3) victory against 3rd ranked Hurricanes (5-5) 66-60. International guard Daniel Conorque (193-91, college: Pima CC) notched 21 points, 9 rebounds and 8 assists to lead the effort and Delvon Henderson supported him with 14 points, 8 rebounds and 6 blocks. Even 9 points, 5 rebounds and 4 assists by international guard Glency Lopez (-97) did not help to save the game for Hurricanes. Both coaches used bench players which allowed the starters a little rest for the next games. Dream Ballers maintains second position with 8-3 record behind leader Verdes. Defending champion Hurricanes dropped to the fourth place with five games lost. Dream Ballers will have a break next round, and it should allow them to practice more before next game. Hurricanes' supporters look forward to an exciting derby game next round, where their team will travel locally in Belize City to the arena Running Rebels. NEBL top team - Verdes (9-1) managed to deliver another win on Saturday. This time they beat seventh ranked Running Rebels (1-8) in Belize City 87-76. Richard Troyer fired 19 points for the winners. Isaiah Thomas produced 25 points (on 9-of-11 shooting from the field) for lost side. Both coaches tested many bench players and allowed the starting five to rest. Verdes have an impressive eight-game winning streak. They maintain first position with 9-1 record. Running Rebels lost fourth consecutive game. They stay at the bottom place with eight games lost. Verdes will meet at home Red Bandits (#6) in the next round where they are favorite. Running Rebels' supporters look forward to an exciting derby game next round, where their team will face at home their local rival from Belize City Hurricanes. Fourth ranked Tigersharks (6-4) crushed at home 6th ranked Red Bandits (2-8) by 36 points 104-68, which is the biggest margin this round. Worth to mention a great performance of Martevuius Adams who helped to win the game recording 19 points and 7 rebounds. The winner was already known earlier in the game, so both coaches allowed to play the bench players saving starting five for next games. Tigersharks have a solid three-game winning streak. They moved-up to third place. Red Bandits at the other side keep the sixth position with eight games lost. Tigersharks' next round opponent will be Defenders (#5) in Belize City. Red Bandits will play against the league's leader Verdes and hope to win that game. Fourth ranked Tigersharks (6-4) crushed at home 6th ranked Red Bandits (2-8) by 36 points 104-68, which is the biggest margin this round. Tigersharks dominated down low during the game scoring 72 of its points in the paint compared to Red Bandits' 40. They outrebounded Red Bandits 44-27 including 33 on the defensive glass. Worth to mention a great performance of center Martevuius Adams who helped to win the game recording 19 points and 7 rebounds. The former international forward Douglas Valley (194-95) contributed with 13 points for the winners. Four Tigersharks players scored in double figures. Forward Kyle Pascascio (191) replied with 21 points (made all of his nine free throws !!!) and forward Brandon Flowers (196-95) added 10 points and 7 rebounds in the effort for Red Bandits. The winner was already known earlier in the game, so both coaches allowed to play the bench players saving starting five for next games. Tigersharks have a solid three-game winning streak. They moved-up to third place. Red Bandits at the other side keep the sixth position with eight games lost. Tigersharks' next round opponent will be Defenders (#5) in Belize City. Red Bandits will play against the league's leader Verdes and hope to win that game. Very significant was Dream Ballers' (#2, 8-3) victory against 3rd ranked Hurricanes (5-5) 66-60. Dream Ballers players were unselfish on offense dishing 21 assists. They brought some defensive toughness making 13 blocks. International guard Daniel Conorque (193-91, college: Pima CC) notched 21 points, 9 rebounds and 8 assists to lead the effort and Delvon Henderson supported him with 14 points, 8 rebounds and 6 blocks. Even 9 points, 5 rebounds and 4 assists by international guard Glency Lopez (-97) did not help to save the game for Hurricanes. 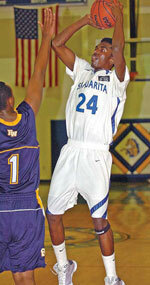 Forward Akeem Watters (186-95) added 10 points and 6 rebounds for lost side. Both coaches used bench players which allowed the starters a little rest for the next games. Dream Ballers maintains second position with 8-3 record behind leader Verdes. Defending champion Hurricanes dropped to the fourth place with five games lost. Dream Ballers will have a break next round, and it should allow them to practice more before next game. Hurricanes' supporters look forward to an exciting derby game next round, where their team will travel locally in Belize City to the arena Running Rebels. NEBL top team - Verdes (9-1) managed to deliver another win on Saturday. This time they beat seventh ranked Running Rebels (1-8) in Belize City 87-76. Verdes forced 19 Running Rebels turnovers. The former international forward Richard Troyer (196-84, college: Utah Valley) fired 19 points for the winners. 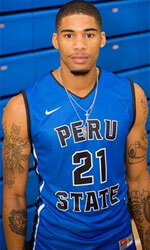 American point guard Kris Frazier (201, college: Peru St.) chipped in 12 points and 6 rebounds (on 6-of-7 shooting from the field). American point guard Isaiah Thomas (188-93) produced 25 points (on 9-of-11 shooting from the field) and Julien Travis added 16 points and 8 rebounds (on 7-of-9 shooting from the field) respectively for lost side. Both coaches tested many bench players and allowed the starting five to rest. Verdes have an impressive eight-game winning streak. They maintain first position with 9-1 record. Running Rebels lost fourth consecutive game. They stay at the bottom place with eight games lost. Verdes will meet at home Red Bandits (#6) in the next round where they are favorite. Running Rebels' supporters look forward to an exciting derby game next round, where their team will face at home their local rival from Belize City Hurricanes. The most exciting game of round 10 in the NEBL took place in Belize City. This derby game ended with only two-point home defeat of 5th ranked Defenders (4-6) to second ranked Dream Ballers (8-3) 83-81 on Friday evening. Great defensive blocking was one of the keys in this match when Dream Ballers made 9 blocks. Guard Jamal Kelly (-90) scored 27 points to lead the charge for the winners and Delvon Henderson chipped in 13 points, 12 rebounds, 4 assists and 6 blocks during the contest. Four Dream Ballers players scored in double figures. At the losing side American center Nigel Jones (201-90, college: Talladega) responded with 21 points and his fellow American import point guard Mykeil Tzul (183, college: Doane) scored 19 points and 4 assists. Defenders' coach tried various players' combinations and tested in total fourteen players in this game, but that didn't help. 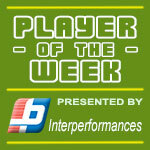 Dream Ballers maintains second position with 8-3 record behind leader Verdes. Defenders at the other side keep the fifth place with six games lost. Dream Ballers will have a break next round, and it should allow them to practice more before next game. Defenders will play on the road against Tigersharks (#3) in San Pedro and it may be a tough game between close rivals.